Die Jovis, 29 Junii, 1648. Petitions from Trinity House, &c.
Tryal of Persons in Chester. ORDERED, That a Month's Pay be forthwith paid unto the Officers and Soldiers of the County of Lancashire, now employed against the common Enemy in the North Parts of England: And that Four thousand Pounds be paid, out of the Sequestrations of the County of Westmerland, for that Purpose: And that the Gentlemen that serve for the County of Lancaster, do present the Names of some Gentlemen of that County, to be added to the Committee of Sequestrations in the County of Westmorland: And that the Gentlemen who serve for the County of Lancaster do prepare and bring in an Ordinance for that Purpose. Ordered, That a Letter of Thanks, to be signed by Mr. Speaker, be sent to Colonel Ashton, for his good Services in Westmorland. Colonel Moore is to prepare this Letter. The humble Petition of the Commander in Chief, and the Officers of the County of Lancaster, in Behalf of themselves, and their Soldiers, ordered and appointed by the Committee of the said County to engage against the common Enemy in the North Parts of England, was this Day read. Ordered, That Power be given to Colonel Ashton to give Order to the Committee of Westmorland, so to demolish the Tower of Arneside and Bethem House, in the County of Westmorland, as to make them untenable. It is further Ordered, That the Gentlemen of Sussex go presently to Darby House, to consider, What is best and fittest to be done therein. Ordered, That the Serjeant that attends this House do repair to Mr. Middleton of Sussex; and acquaint him, that his attendance is required in this House. A Letter from Newcastle upon Tyne, of 25 Junii 1648; and the Petition of the Mayor, Aldermen, Sheriffs, and Common Council of the Town of Newcastle upon Tyne; were this Day read. Ordered, That the Recorder of London be desired to communicate the Letter of the Mayor, Aldermen, Sheriffs, and Common Council of the Town of Newcastle upon Tyne, of 22 Junii 1648, and their Petition, to the Lord Mayor of London: With Direction, that he be desired to call a Common Council of the City of London; and to inform them of the Necessity of raising Four thousand Pounds a Month, for the constant Pay of Three Regiments of Foot in the said Town, for Defence of that Town: And that, before the House would do any thing therein, they thought fit to acquaint them therewith; to know, Whether they can propound a better Expedient than is mentioned in the said Letter, for Pay of the said Garison; and to desire their speedy Answer therein. Ordered, That Dr. Annesley be desired to preach, in the place of Mr. Case, the next Fast Day. The humble Petition of the Inhabitants of the Borough of Reading in the County of Berks was this Day read. Ordered, That the said Petition be referred to the Committee of Privileges. 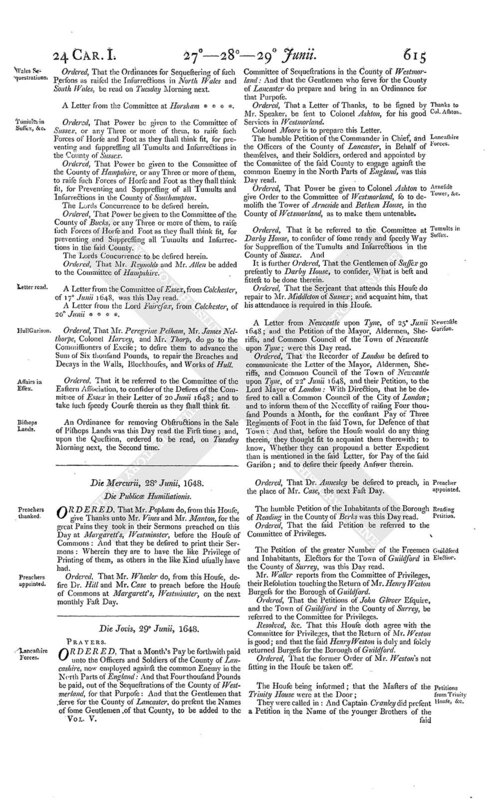 The Petition of the greater Number of the Freemen and Inhabitants, Electors for the Town of Guildford in the County of Surrey, was this Day read. Mr. Waller reports from the Committee of Privileges, their Resolution touching the Return of Mr. Henry Weston Burgess for the Borough of Guildford. Ordered, That the Petitions of John Glover Esquire, and the Town of Guildford in the County of Surrey, be referred to the Committee for Privileges. Resolved, &c. That this House doth agree with the Committee for Privileges, that the Return of Mr. Weston is good; and that the said Henry Weston is duly and solely returned Burgess for the Borough of Guildford. Ordered, That the former Order of Mr. Weston's not sitting in the House be taken off. They were called in: And Captain Cranley did present a Petition in the Name of the younger Brothers of the said Corporation, and the other Seamen, directed to them; and another Petition, in the Name of the Commanders, Masters, and Mariners, of the Shipping belonging to the River of Thames; and . . . other Petition, in the Name of the Masters, Wardens, and Fellowship of the Trinity House. Which said several Petitions (after the Petitioners were withdrawn) were read. 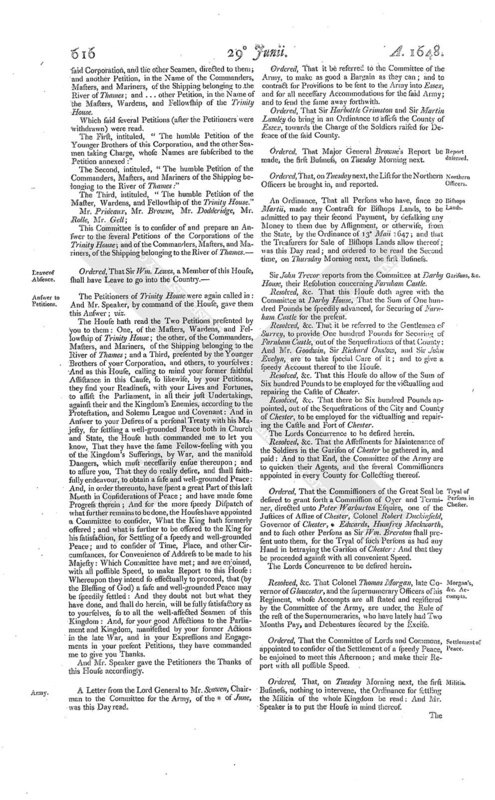 The First, intituled, "The humble Petition of the Younger Brothers of this Corporation, and the other Seamen taking Charge, whose Names are subscribed to the Petition annexed:"
The Second, intituled, "The humble Petition of the Commanders, Masters, and Mariners of the Shipping belonging to the River of Thames:"
The Third, intituled, "The humble Petition of the Master, Wardens, and Fellowship of the Trinity House." The Petitioners of Trinity House were again called in: And Mr. Speaker, by command of the House, gave them this Answer; viz. The House hath read the Two Petitions presented by you to them: One, of the Masters, Wardens, and Fellowship of Trinity House; the other, of the Commanders, Masters, and Mariners, of the Shipping belonging to the River of Thames; and a Third, presented by the Younger Brothers of your Corporation, and others, to yourselves: And as this House, calling to mind your former faithful Assistance in this Cause, so likewise, by your Petitions, they find your Readiness, with your Lives and Fortunes, to assist the Parliament, in all their just Undertakings, against their and the Kingdom's Enemies, according to the Protestation, and Solemn League and Covenant: And in Answer to your Desires of a personal Treaty with his Majesty, for settling a well-grounded Peace both in Church and State, the House hath commanded me to let you know, That they have the same Fellow-feeling with you of the Kingdom's Sufferings, by War, and the manifold Dangers, which must necessarily ensue thereupon; and to assure you, That they do really desire, and shall faithfully endeavour, to obtain a safe and well-grounded Peace: And, in order thereunto, have spent a great Part of this last Month in Considerations of Peace; and have made some Progress therein; And for the more speedy Dispatch of what further remains to be done, the Houses have appointed a Committee to consider, What the King hath formerly offered; and what is further to be offered to the King for his satisfaction, for Settling of a speedy and well-grounded Peace; and to consider of Time, Place, and other Circumstances, for Convenience of Address to be made to his Majesty: Which Committee have met; and are enjoined, with all possible Speed, to make Report to this House: Whereupon they intend so effectually to proceed, that (by the Blessing of God) a safe and well-grounded Peace may be speedily settled: And they doubt not but what they have done, and shall do herein, will be fully satisfactory as to yourselves, so to all the well-affected Seamen of this Kingdom: And, for your good Affections to the Parliament and Kingdom, manifested by your former Actions in the late War, and in your Expressions and Engagements in your present Petitions, they have commanded me to give you Thanks. And Mr. Speaker gave the Petitioners the Thanks of this House accordingly. A Letter from the Lord General to Mr. Scawen, Chairman to the Committee for the Army, of the * of June, was this Day read. Ordered, That it be referred to the Committee of the Army, to make as good a Bargain as they can; and to contract for Provisions to be sent to the Army into Essex, and for all necessary Accommodations for the said Army; and to send the same away forthwith. Ordered, That Sir Harbottle Grimston and Sir Martin Lumley do bring in an Ordinance to assess the County of Essex, towards the Charge of the Soldiers raised for Defence of the said County. Ordered, That Major General Browne's Report be made, the first Business, on Tuesday Morning next. Ordered, That, on Tuesday next, the List for the Northern Officers be brought in, and reported. 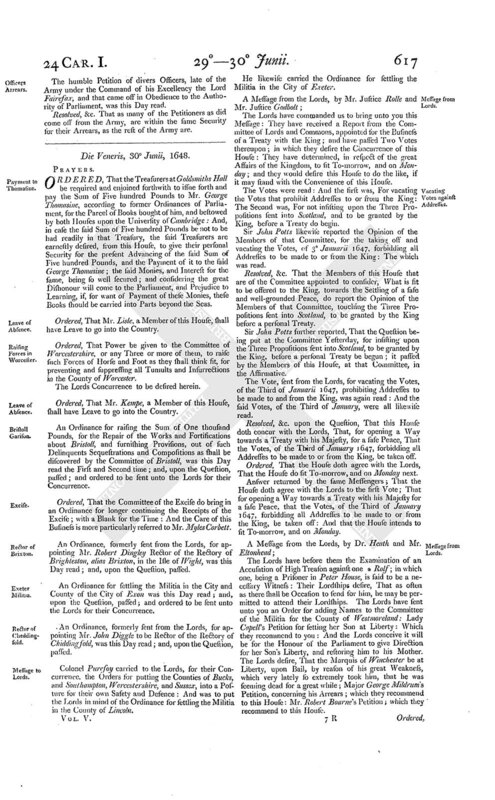 An Ordinance, That all Persons who have, since 20 Martii, made any Contract for Bishops Lands, to be admitted to pay their second Payment, by defalking any Money to them due by Assignment, or otherwise, from the State, by the Ordinance of 13 Maii 1647; and that the Treasurers for Sale of Bishops Lands allow thereof; was this Day read; and ordered to be read the Second time, on Thursday Morning next, the first Business. Sir John Trevor reports from the Committee at Darby House, their Resolution concerning Farnham Castle. Resolved, &c. That this House doth agree with the Committee at Darby House, That the Sum of One hundred Pounds be speedily advanced, for Securing of Farnham Castle for the present. Resolved, &c. That it be referred to the Gentlemen of Surrey, to provide One hundred Pounds for Securing of Farnham Castle, out of the Sequestrations of that County: And Mr. Goodwin, Sir Richard Onslow, and Sir John Evelyn, are to take special Care of it; and to give a speedy Account thereof to the House. Resolved, &c. That this House do allow of the Sum of Six hundred Pounds to be employed for the victualling and repairing the Castle of Chester. Resolved, &c. That there be Six hundred Pounds appointed, out of the Sequestrations of the City and County of Chester, to be employed for the victualling and repairing the Castle and Fort of Chester. Resolved, &c. That the Assessments for Maintenance of the Soldiers in the Garison of Chester be gathered in, and paid: And to that End, the Committee of the Army are to quicken their Agents, and the several Commissioners appointed in every County for Collecting thereof. Ordered, That the Commissioners of the Great Seal be desired to grant forth a Commission of Oyer and Terminer, directed unto Peter Warburton Esquire, one of the Justices of Assize of Chester, Colonel Robert Duckinfield, Governor of Chester, * Edwards, Humfrey Mackworth, and to such other Persons as Sir Wm. Brereton shall present unto them, for the Tryal of such Persons as had any Hand in betraying the Garison of Chester: And that they be proceeded against with all convenient Speed. Resolved, &c. That Colonel Thomas Morgan, late Governor of Gloucester, and the supernumerary Officers of his Regiment, whose Accompts are all stated and registered by the Committee of the Army, are under the Rule of the rest of the Supernumeraries, who have lately had Two Months Pay, and Debentures secured by the Excise. Ordered, That the Committee of Lords and Commons, appointed to consider of the Settlement of a speedy Peace, be enjoined to meet this Afternoon; and make their Report with all possible Speed. Ordered, That, on Tuesday Morning next, the first Business, nothing to intervene, the Ordinance for settling the Militia of the whole Kingdom be read: And Mr. Speaker is to put the House in mind thereof. The humble Petition of divers Officers, late of the Army under the Command of his Excellency the Lord Fairefax, and that came off in Obedience to the Authority of Parliament, was this Day read. Resolved, &c. That as many of the Petitioners as did come off from the Army, are within the same Security for their Arrears, as the rest of the Army are.